Last week, I spent a lot of time thinking and reading about the events of the 1987 market crash. One of the catalysts for the crash back then was a heightened degree of trade deficits (sound familiar)? with a specific focus on Germany. On October 14, 1987, the U.S. announced a larger-than-expected trade deficit. In response, Treasury Secretary James Baker got tough with U.S. trading partners. 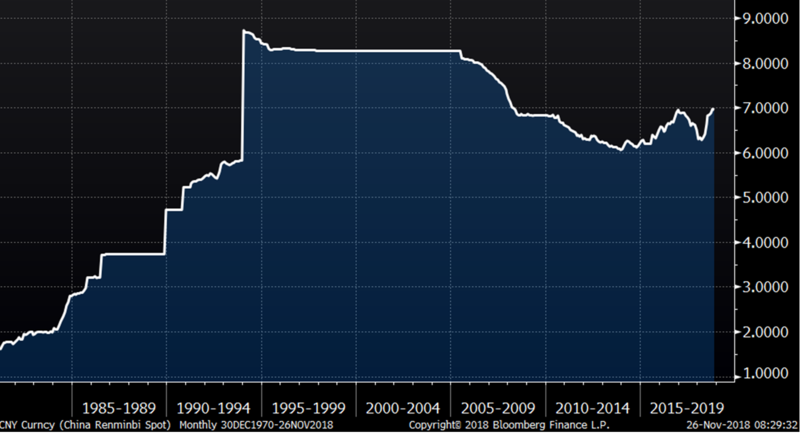 Baker's message on Saturday the 17th to Germany was: "if you don't lower rates, we're going to lower the dollar and you're going to have export problems." Turns out the U.S. has been fighting trade wars since the U.S. and Germany broke the Bretton Woods Agreement and took the world off the gold standard in 1971. Ever since, currencies have been a trade war tool. Have a look at what China did in the 1980s. Not only do they have a labour cost advantage, they have a massive currency advantage too. You can see why the 7 CNY level is so important. When the U.S. agreed to allow China into the WTO, part of the agreement was to let their currency strengthen. On Friday, we saw U.S. President Donald Trump remark that Treasury Secretary Steven Mnuchin is better at producing movies and should probably go back to that — I mean really, he’s just the money guy, he did not write them. We also know from Trump’s Twitter feed he is not happy with the U.S. Federal Reserve's rate hikes. He also thinks he is responsible for oil prices falling. Trump's meddling in regards to the Fed’s independence is a crucial policy error from the president. I often like to go back in history and look for periods of similar risks to see what investor behaviour might be like. They say history does not repeat, but it rhymes an awful lot. The 1987 market was not exactly like the current market, but it was similar. Earlier this year, I looked at a study done by Jeremy Grantham, a European based value manager (www.GMO.com), that paralleled the 2017 run up into the spike in early 2018. He considered that the fear of missing out could still drive the markets much higher like in the late 1920s. So far he’s been wrong. We did see a higher high for the S&P 500 in September, but it died rather swiftly. The one main thing in common with 1987 is that we saw a 10 per cent correction earlier in the year followed by a new highs and then another 10 per cent correction followed by the crash. Let’s just say the set up is eerily similar. While I don’t think (hope) we will see a crash as China and President Xi Jinping probably understand these risks. Trump has not tweeted about stocks in a while and he might just get it too — though we have a tougher time with that belief. There are several other issues complicating the market risk factors like Brexit and the Italian budget, but we expect those to not provide a systemic catalyst like U.S.-China trade could. 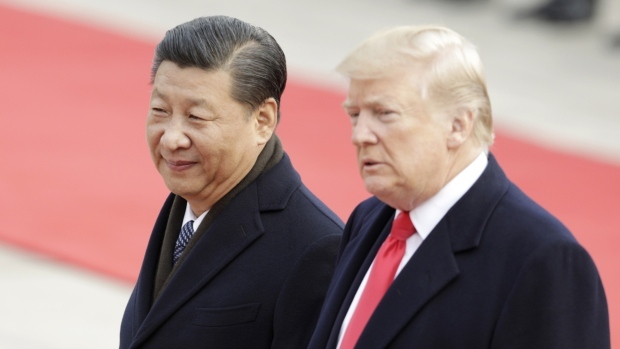 Make no mistake, if those two go bad in the coming weeks (Dec. 12 Brexit vote in U.K. parliament), it could add to a snowball effect should the G20 meetings between Trump and Xi Jinping not bear any fruit. So the question you need to ask yourself this week is: am I ready for this and if it happens, can I take advantage of it and not panic? In past crash-type markets, they are always a buy opportunity. The crash is typically the bottom capitulation. My guess is that we could see a five-to-10 per cent gap down if Trump and Xi do not show progress. If Trump says they are going ahead with 25 per cent tariffs on Jan. 1, the market has a good chance of a mini crash. Say you are a typical 60 per cent equity 40 per cent bond investor. I would look to be closer to 40 per cent equity, 60 per cent bond going into this event risk. If the worst-caser scenario plays out, use the gap down to go back to your longer-term target. If it does not, you will still participate in the market rally that likely happens in the case where they shake hands and agree to find a solution. That is the most likely outcome. Our fall roadshow is coming to a close, we have only two more events this season in B.C. Come out and find out How to profit while protecting in the longest bull market of all-time where I will look at some of my top sector ETF picks for the next few years and teach you how to build balanced portfolios using less risky options strategies that should work better for you in the next few years. Register free at www.etfcm.com and as always we ask for volunteer donations to one of our two favourite charities. Children’s cancer research at the Sick Kids Hospital and Alzheimer’s and dementia research at the Baycrest Hospital.